Posted on July 20th, 2014 in Newport Rhode Island. As mentioned in my Top Ten Things to do in Newport, going to the beach is one of our favorite things to do in Newport! We are very fortunate to have several different beaches to choose from! For those that like the quiet, non-wave style beaches, there are Third Beach in Middletown and Gooseberry Beach in Newport. Third Beach is part of the Sachuest Beaches in Middletown, RI and is on a cove around the bend from the main beach. It tends to be quieter with young children. Gooseberry Beach is located around the Ocean Drive in Newport, RI. This beach is very popular with locals and tourists. 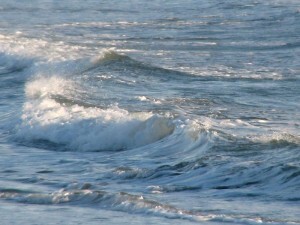 Even though it is located right on the Atlantic, it is in a cove with very gentle waves. The setting with large rocks and beautiful coastal homes is stunning! For those that desire the more typical beach setting with waves, “Second Beach” in Middletown and Easton’s Beach or “First Beach” in Newport are the two to choose from. Easton’s Beach in Newport, RI (known locally as First Beach) is a mile long beach located just down the hill from the entrance to Cliff Walk. This beach is most popular with tourists as it is close to town. If you go to First Beach, make sure to stop by the snack shack for the delicious lobster rolls (twin rolls for $12). Middletown’s ” Second Beach” (known formally as Sachuest Beach) is popular with locals and tourists as the setting is beautiful and the waves tend to be a little better than First Beach. Parking at Second Beach can be challenging on the weekends. One last beach to mention, is known as “Reject Beach”. This tiny beach is located at the southern end of the cliff walk and the beginning of the Ocean Drive. It gets it’s name as it is located next to the private Bailey’s Beach. There is no parking nor facilities at “Reject Beach”, you must walk or bike to get to it. Excluding “Reject Beach”, all of the beaches have parking for a fee (higher on the weekends-about $20, and $10 mid-week). Guests of the Samuel Durfee House can borrow beach bags with towels and chairs.